Governor Mike Huckabee Tours Clow Valve Machine Shop | McWane, Inc.
Clow Valve hosted a visit from Governor Mike Huckabee this week as part of his “Factories, Farms and Freedom” tour through Iowa. Governor Huckabee also did an interview with CNN for the show “The Lead” with Jake Tapper from inside the machine shop which aired at 4:00p.m. on May 6. 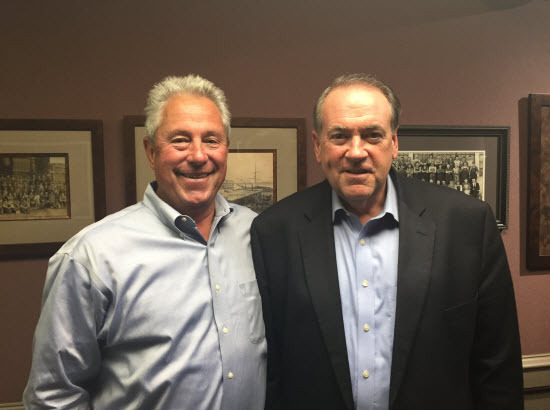 Governor Huckabee has announced that he will be running for President in the next election and was kicking off his campaign by visiting businesses in Iowa. As always, we welcome an opportunity to showcase our state-of-the art facilities. In addition to touring Clow Valve on his two-day visit to Iowa, he also held a meet-and-greet at Charlie’s American Grill in Sioux City, Iowa, and Pizza Ranch in Cedar Rapids, Iowa. Posted on May 7, 2015, in Events and tagged Clow Valve, CNN, factories, farms, freedom, Governor Huckabee, Iowa, McWane, Mike Huckabee, visits. Bookmark the permalink. Comments Off on Governor Mike Huckabee Tours Clow Valve Machine Shop.